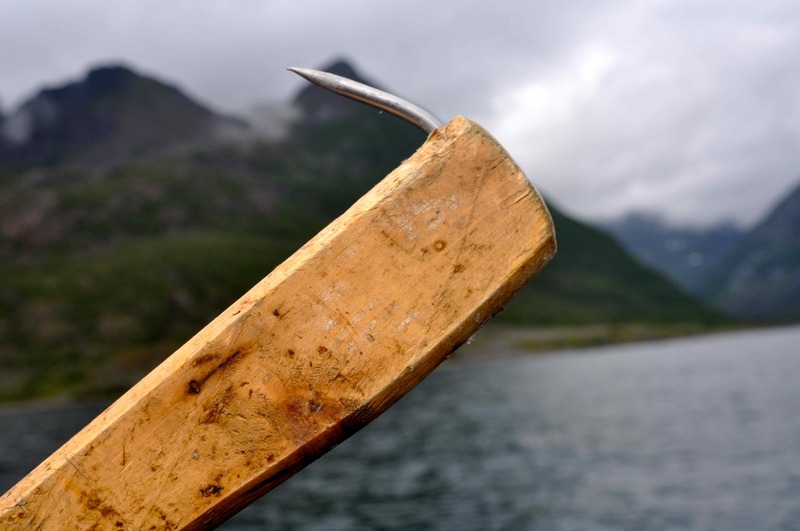 The dictionary definition for a gaff is as follows: ‘a stick with a hook, or a barbed spear, for landing fish’. Well that cold, grey, and heavily overcast day fishing the eastern shoreline of the Kvaenangen Fjord in the far north of Norway the fish we were faced with landing certainly qualified as large, and right at that moment I’d have done pretty much anything to have a decent gaff at my disposal. The only implement that we did have to help land that great halibut in no way conformed to the above definition of a gaff, it merely served to agitate the thing! Four times I had managed to bring the powerful fish to the side of the boat, where for a briefest moment or two it had lay quietly alongside, had we had a decent gaff aboard, that would have been the end of the story. But we did not have a decent gaff, what we had was the usual implement one finds aboard Norwegian angling boats, which is more accurately described as a piece of wood with a bent nail sticking out of the end of it. 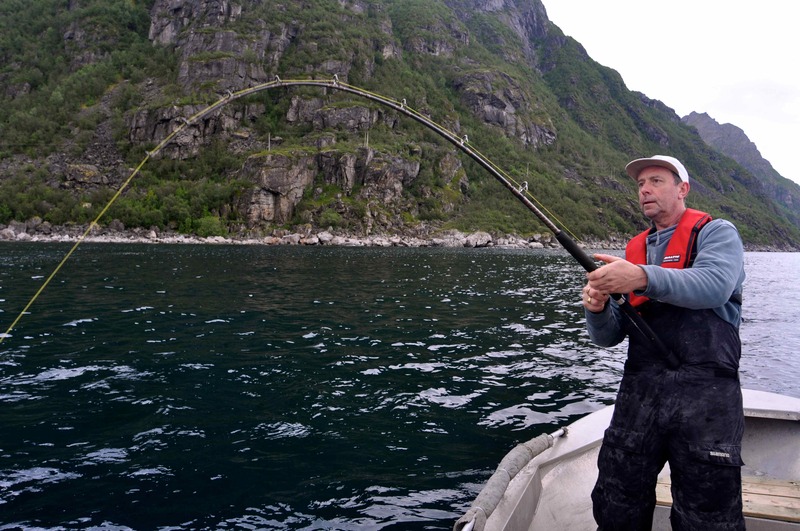 The Norwegians are quite adept at landing cod with one of these, even quite large ones, but each time my boat partner, Terry Smith, attempted to secure the fish he simply managed to enrage it. Each prick would result in an explosion of white water, quickly followed by my rod getting bent double, the tip dragged below the surface, as the fish dived the 200ft all the way back down to the bottom. It was late afternoon and our adventure had begun the previous night, when we had loaded our tackle, travel bags and provisions for three days aboard one of the small open aluminium fishing boats based at Skjervoy fish camp. It was a little after midnight and we were dog tired following 20 hours of travelling that had consisted of two flights, two ferry trips and a long drive. Of course being summer it was still light that far north, but a thick blanket of dense grey cloud totally obscured the sun with an imminent threat of rain. We were staying at a private house on the far side of the fjord, a forty minute run from Skjervoy, and thankfully the rain held off, but the following morning we woke to see the fjord covered in a mess of white caps. We sat and stared gloomily out at the scene, pondering our situation over the first of many cups of coffee. A phone call to the manager at Skjervoy fish camp provided the hopeful news that the wind was set to drop significantly by the afternoon, and thankfully thats exactly what happened. By 2 O’clock we were back aboard our little boat going fishing, it was cold and a light drizzle necessitated that we wore our waterproofs, but by now at least the wind had all but gone. That these northern contain substantial populations of quality fish is never disputed, the trick when fishing in Norway is in finding feeding fish. As you get to know an area well you become familiar with certain sandbanks, drop offs, reefs etc that consistently hold a head of fish, and a few minutes studying a decent chart of the area or the GPS chart plotter should quickly reveal a few likely spots to try. There is, however, one sure fire way of fast tracking the process of finding feeding fish in Norway; watching the sea birds. reasonably well, and having positioned us on the edge of a gently sloping bank in 60m of water it was with an air of confidence that Terry and I watched as our pirks flickered and flashed as they sunk swiftly and disappeared in the clear water beneath our boat. Terry is a long term fishing friend with whom I have fished at many locations around the world. He is a very keen lure angler and his huge interest in using hi-tech speed jigs evolved into importing good jigs from around the world, initially for his use but has recently resulted in him setting up his own tackle business; South Coast Fishing Jigs. Consequently he had brought along several new designs for us to experiment with, several of which had been designed specifically with cold water species in mind. It very quickly became apparent that the long, slim design of these lures was a major bonus when fishing in deep water as they dropped rapidly down through the water column, thus maximising the most effective window of opportunity which falls when the lures are fished in as close to a vertical line beneath the boat as possible. Also, we planned on fishing the lures in conjunction with single assist hooks, rather than the conventional trebles. Not only are assist hooks generally stronger and sharper than most trebles, but they minimise the amount of foul hooked fish. Catch a fish on an assist hook and almost always it will be hooked firmly and cleanly in the corner of the mouth; few fish escape from an assist hook. During the first hour or so we tried various drifts, a light northerly running us across the breadth of Olderfjord. 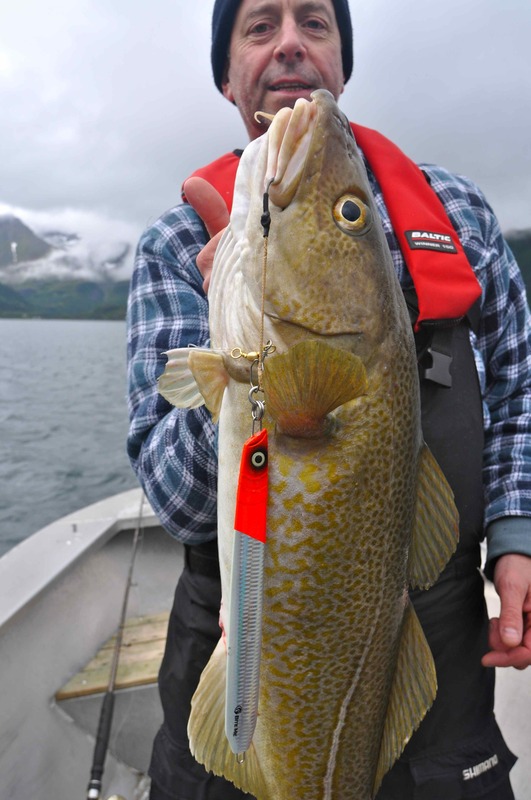 We picked up a cod or two on most drifts, but by Norwegian standards the fishing was slow and with an average weight of less than 10lb those fish that we were catching were small. 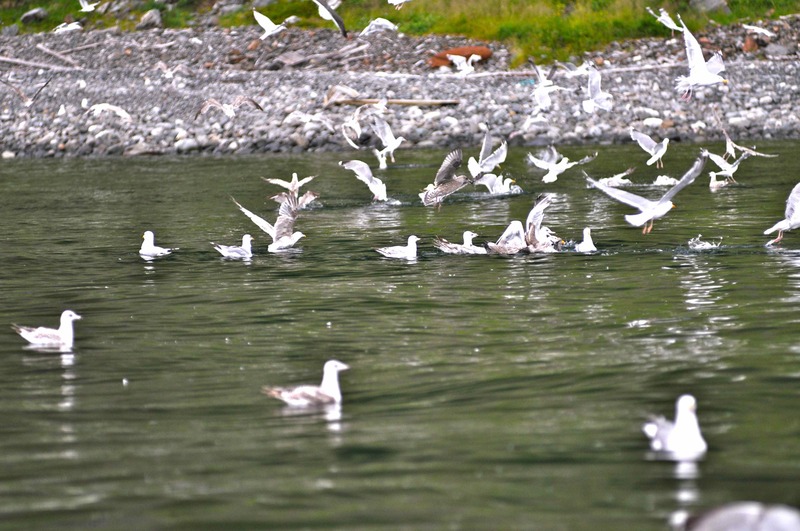 It was when we were reeling up to relocate for another drift that I first spotted the birds, a huge mixed flock of gulls, terns, puffins, guillemots and razorbills that clearly were feeding in a frenzy at the northern most entrance to the fjord. From experience we both knew this was a shore sign of shoaling coalfish, and we rightly suspected that they had trapped a shoal of small herring into a tightly compacted bait ball at the surface; most of the cod we had caught so far had coughed up fresh herring. Of course we ran straight over to intercept the feeding melee, and as we did Terry tackled up a light spinning rod armed with one of his new ‘Bite Me’ casting jigs he had brought along to try. Intended for use in the tropics when casting for the likes of trevally and tuna, Terry was confident the superb action of these lures would work equally well for cold water species such as coalfish, pollack, cod and bass; and he was right! I cut the engine about 80 yards away from the leading edge of the feeding frenzy, by which time we could see coalfish breaking through the surface film as they snatched at the smaller bait fish. With flick of the wrist Terry launched the little lure into the thick of the action, and no sooner had he snapped the reel bail shut and started to crank the handle, when he was tight into a fish, and judging by the bend in his rod and the screaming clutch, clearly it was a decent fish, too. 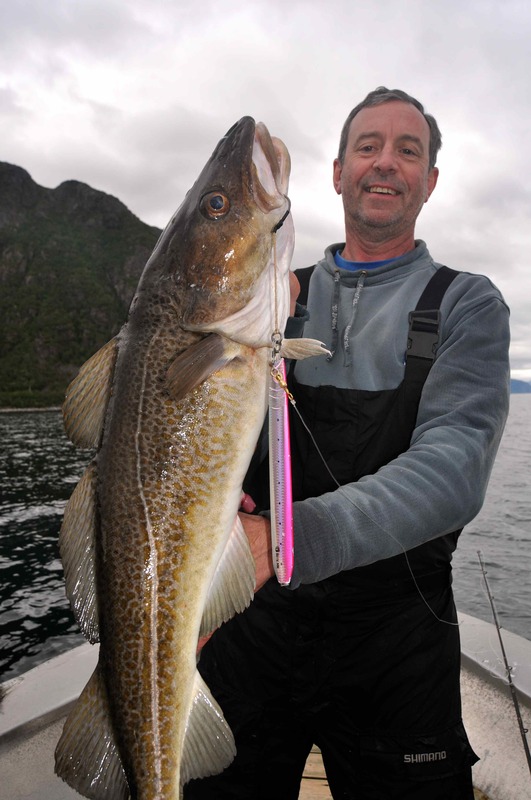 Pound for pound the coalfish is one of the strongest fighting fish you’ll hook anywhere in Northern Europe. Unlike their close relatives the pollock they are unaffected by sudden pressure changes, and consequently often dive powerfully back into the depths from the surface. You should not expect to land any coalfish hooked on light tackle until it is well and truly played out. The first fish Terry hooked was a solid 7-pounder, the next a tad heavier. 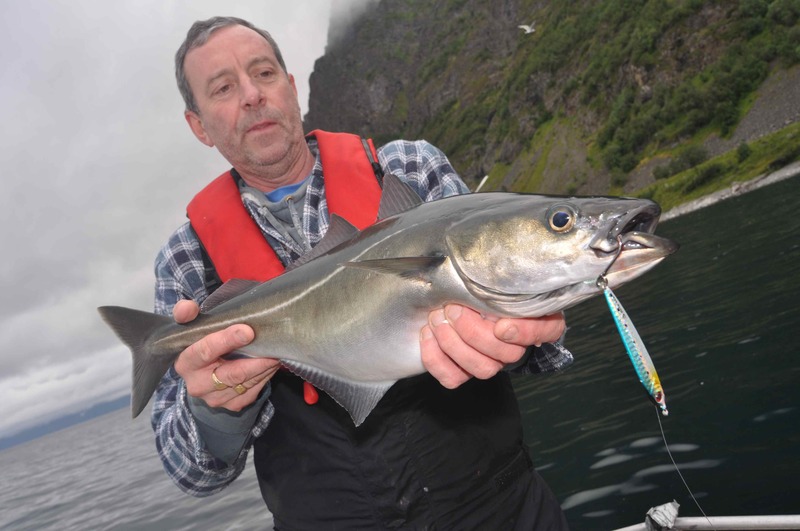 As coalfish go these were modest fish, twenty and even thirty pounders are regularly caught throughout Norway, but given the tackle we were using we enjoyed an hour of fast and furious action. 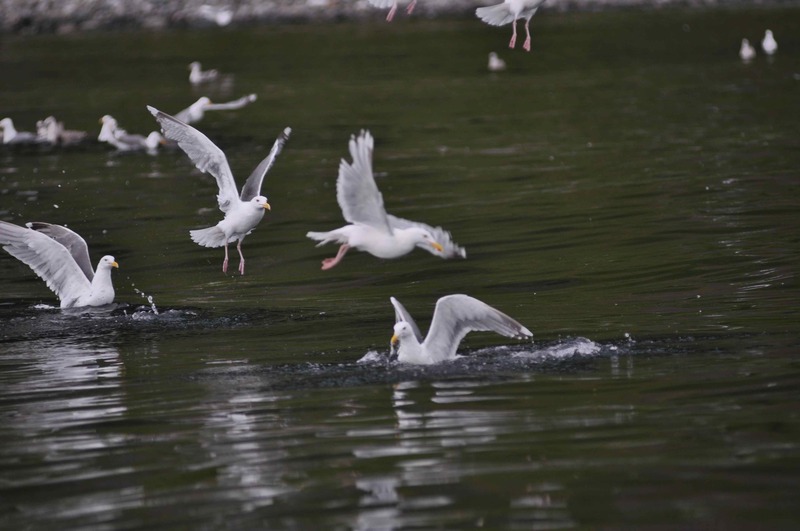 Then, one by one, the sea birds settled down upon the surface of the fjord, indicating that at least for the time being the coalfish had either satisfied their appetite for herring, or moved on. We wanted to catch some of the big cod and other species Norway is quite rightly famous for, and with the weather staying fare we moved on to find another mark. We stopped at a few spots that looked of interest on the chartplotter, but mostly all these produced was an occasional small cod or masses of very small coalfish. Heading back in the general direction of our digs, once again we came across some interesting bird activity. This time it was just one or two gulls hovering above the surface along with a dozen or so puffins and guillemots diving for fish. We stopped, dropped our jigs, and were absolutely delighted to discover we had found a shoal of feeding cod. They weren’t monster’s but they were feeding. The average size was well over 10lb and many of those we caught weighed better than 20lb; the bigger specimens were closer to 30lb than 20lb. It was action packed fishing that resulted in pretty much a fish a drop. Then, suddenly, after boating about a dozen decent cod I found myself connected to a much bigger, much more powerful fish that bent my 20-30lb Shimano travel rod alarmingly and ripped many yards of braid from my reel as it crash dived for the bottom. It didn’t take long to determine I was attached to the one fish that more than any other visiting anglers want to catch in Norway; halibut. Settling down into what I anticipated was going to be a lengthy fight, my thoughts moved on to what we were going to do should I manage to bring the fish to the boat? Our host had requested we stock his cabin freezer with some fish, prime halibut fillets would be perfect, but how on earth were we going to land it? We we had the silly little Norwegian gaff, and we readied a rope to try and lasso the fishes tail or possibly feed the rope through its mouth and out through the gills to secure it, which we knew would be a long shot. We weren’t too far from a beach, of sorts, and we mused that depending on its size, attempting to beach the fish might be the best option open to us? 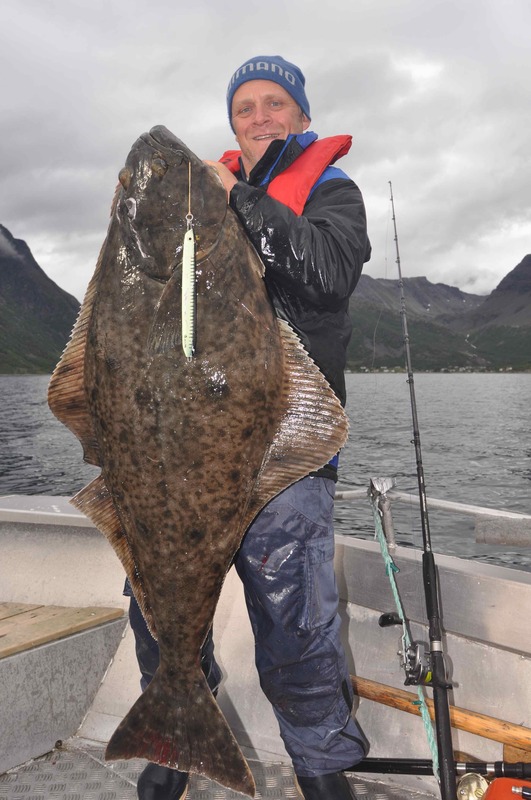 Halibut in Norway range from small ‘chicken halibut’ under 10lb to veritable monsters that in recent years have topped 400lb, and for a long time I had no idea what size fish I was hooked to, other than it was appreciably larger than any I had previously caught. Then after perhaps 15 minutes it first came into view, and we could see it was a good fish that looked to be about 80lb, not a monster, but plenty large enough given our dilemma of boating the thing. Terry’s first attempt at ‘gaffing’ the fish ended entirely predictably in a boil of white water and me hanging on to my rod as the fish ran with impressive speed all the way down to the bottom, where for a while it sulked. Steady pressure, a firm hook hold and some patience soon had it moving in the right direction again and ten minutes later it was back within reach, but again attempting to use that excuse for a gaff had little more effect other than driving it wild, resulting in yet another dive for the bottom. The forth time I brought the fish to the boat it came alongside hanging vertically in the water, which was good. Previously it had been lying horizontally, which meant that it could use its large tail to drive itself back into the depths. Halibut like most other fish cannot swim backwards with any force, and I knew this would be our best chance to land it. Once again Terry did his best to secure it and as soon as he made contact I dropped my rod into the bottom of the boat, plunged my arms into the cold water, grabbed hold of a gill, and hauled it into the boat, where it made a most satisfying thump as it slammed onto the deck! Not long afterwards we headed back to our cottage, complete with many pounds of prime, white halibut fillets to stock our hosts freezer, though of course we retained sufficient to ensure we would not be going hungry during the remainder of our trip.